I’m not much into fashion. Not that I do not care about the clothes I wear – I do, and I like clothes, – but I do not follow the trends and barely know luxury brands if I do not see them in stores where I shop. Narciso Rodriguez is one of those brands that I knew only from peripherally seeing the name on bottles on perfume counters. I remember coming across people mentioning that they liked NR’s perfumes in FB and on other blogs. But as I’m not much interested in mainstream perfumes, I’m not sure if I’ve ever tried any of them until recently. I was buying something at a cosmetics counter when a bottle with Narciso Rodriguez name on it attracted my attention. I sprayed it on a paper strip and went on shopping. As time was passing, I kept on sniffing the strip and I liked what I smelled. The circus started once I got home and tried to figure out what exactly I tested and liked… Narciso Rodriguez For Her (EdT) – regular and anniversary editions, Narciso Rodriguez For Her Eau de Parfum – regular and anniversary editions, Narciso Rodriguez For Her Eau de Parfum Delicate Limited Edition, Narciso Rodriguez For Her Eau de Toilette Delicate Limited Edition, Narciso Rodriguez For Her in Color, Narciso Rodriguez For Her Iridescent, Narciso Rodriguez For Her L’Absolu, Narciso Rodriguez L’Eau For Her, Narciso, Narciso Eau de Toilette – and all that not counting several additional variations of these name with the additional “musk,” “Poudree,” “Rouge” and probably a couple more. 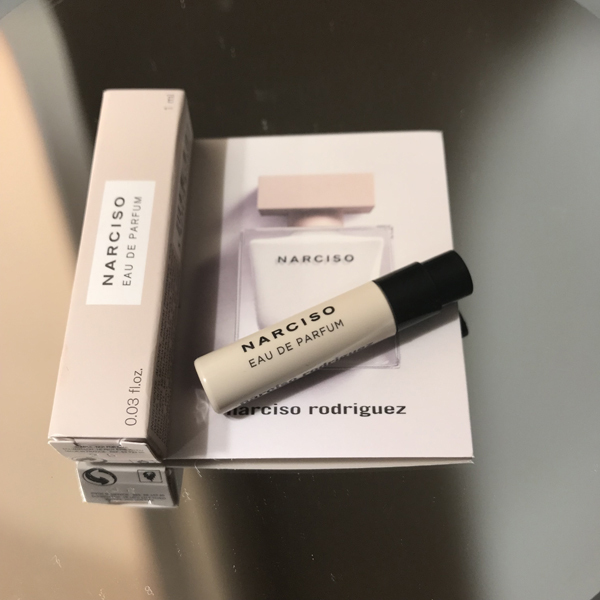 After going through all the pictures and comparing perfume names, bottle shapes and colors, I came to the conclusion that it was Narciso (EdP), a sample of which I happened to have (it was one of those “Take one” free samples you can get from time to time at Nordstrom) but had never come around trying. Narciso, created in 2014 by Aurelien Guichard, is easy to like for those who are not into shy perfumes. Official notes are Bulgarian rose, gardenia, white and black cedar wood, musk and vetiver but I can’t say that I smell either of the floral notes. I mean, it is a floral perfume but flowers are rather abstract. Narciso is warm and powdery scent. It is feminine to the degree where it might be worn by a man who’s into bold perfumes. I’m debating whether I want to get a bottle, or if I should go with a decant from ScentBird. On one side, I don’t think I’ll wear it often enough to warrant more than 7 ml ($14.95 including S&H). On the other, I find that white square bottle strangely appealing (especially since it can be found online at $45 for a 50 ml bottle). Have you tried any perfumes from the brand? This entry was posted in Favorite Perfumes and tagged Aurelien Guichard, Narciso, Narciso Rodriguez For Her. Bookmark the permalink. I remember trying Narciso when it came out and not being keen despite the rave reviews. However I recommended to my co-worker and whenever I think she smells great she’s wearing it. It might be one of those that I like better at a bit of a distance. As Vero Kern says, we have a tendency to push our noses up close to a perfume and that’s not the way it’s intended to be experienced. I really like the bottle too! I’m curious now to try the next one – Poudree – because it’s bottle (similar to this one but of a cream color) is even more attractive (for those who does not mind opaque bottles – I’m waiting for Vanessa’s opinion on this one ;) ). There are several perfumes that I prefer on others. I agree, the bottle looks nice and quite photogenic, would look lovely on some arranged perfume photos, in flatlay or other entourage. I’m not 100% sure now but I think it was the one with the cap that felt like it was a rubber? I’m not 100% sure (I touched the cap just a couple of times at a store) but I think it’s hard plastic. I want to try NR For Him – just out of curiosity. I’ll check if anybody carries it around here. Yes, it could have been a plastic, or a plastic coated with more ‘soft & squishy’ kind of rubber. 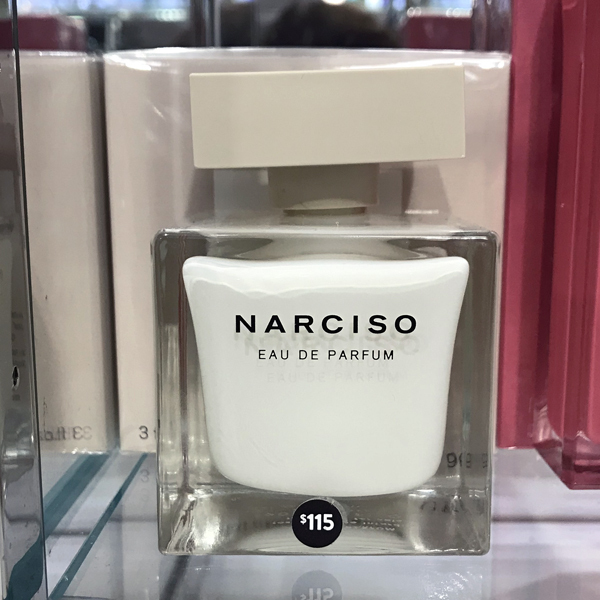 I’ve never tried any Narcisco perfumes. Your description of this one as being warm and powdery makes it sound quite appealing, and I agree with you on the bottle. My goodness, though, the chore of having to figure out which scent you sampled due to the stupid naming of all the iterations!! Makes you wonder how the company keeps track of them when they’re trying to determine sales and inventories for these perfumes (although maybe they don’t account for them individually and just say to themselves, “These are selling like hotcakes, so let’s come out with another before we get a slow down”). I was never a fan of the original scents from this line, and like you, I find their names confusing. When the “white bottle” as I identify it, came out, I tried it and quite liked it. It triggered memories deeply buried of some perfume in my past. But like you I also find the bottle so appealing. It looks like milk to me. Just like I’ve always found those Pinterest pictures with a big glass of white milk and Oreo cookies appealing. And I don’t even like milk! Like you, if I ever get it, I need the bottle. Hmm… I do like milk… Maybe it is partially the bottle’s appeal for me. I think I’ll try wearing it from a couple of samples that I have and if I still want it after that, the bottle it will be. I got a headache just reading through your list of NR iterations, almost as if the font kept getting bigger and bigger and could no longer fit into a name box. In any case, early last year, I got a set of 3 travel sprays from Macy’s for ~ $24 of what I think (!) is the plain EDP but then again, not so sure. I’m almost positive now that I should pass on the ScentBird decant and see if I like it enough to get that bottle. Did you enjoy wearing it? I also compliment strangers (women) on perfumes they are wearing – and in many cases those are mainstream perfumes that I wouldn’t have tried myself. With Narciso… I did like wearing it but I should do it several more times to see if I actually want to own and wear it. I have that white bottle, got it in a swap. It’s pleasant enough but not big love. I am a big fan of Narciso Rodriguez fragrances, Undina. The ones I have worn, male and female, have all been of a high quality, with musk as a common theme. So, of course, I would say “buy now”. Fleur Musc (you can’t miss it in the pink bottle) is also another NR goodie, if you like a big rose scent. I will finish my samples – and then think if I want a bottle: I’m running low on a shelf space (and skin real estate :) ), so I have to choose carefully each next bottle that comes in. But I’ll try to get to test those other perfumes from the line. You see! I think they are shooting themselves in the foot with that: so many people (me including) couldn’t tell them apart.